Just made this !! Absolutely delicious !! Thank you!! This is a great salad. We were missing the fresh dill and celery but it still tasted great. Will make this again. Thank you so much for this recipe. Made it with half olive oil mayo and half greek yogurt. Perfect! Made this today for lunch and it’s incredible! I used some leftover roasted cauliflower but followed the recipe other than that. Amazing flavor! Wow! i have frozen riced cauliflower, can i use this instead, should i cook it or defrost it? Made this tonight, awesome recipe!! This was so good! Absolute hit on our cabin trip. Makes a lot and very addictively good. I used Just Mayo since I can’t have eggs. I just boiled and served eggs on the side for others to add. Perfect and it gets better and better each day! We’re loving your recipes! This was soooo good. Honestly, anyone who is afraid of cauliflower needs to try this – it is very hard to tell that it isn’t potato salad…there is no cauliflower taste to it at all. For me, the success of keto is cooking and planning ahead…make a batch of this on a Sunday afternoon, and you have sides for at least a few days. So yummy!! 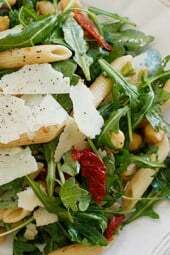 This recipe wins my Best of Summer 2018 Medal! I do, however, boil the florets whole and cut them up after they have cooled. When I chopped them up before cooking, a lot of flakes of cauliflower went by the wayside. OMG! So good! I added another celery stalk to lighten it up a bit, and only used 3 eggs. So delicious! This was so good! Really didn’t miss the potatoes at all! Great recipe! And pretty, too. I looked up online and it says 1# of cauliflower is 1 1/2 cups. Interesting. It’s delicious! Made ahead to serve at Labor Day picnic. I printed it out, and it took a page and a quarter. I wonder if you might consider omitting the spaces on your recipes so they fit on 1 page? Just a thought. Carry on! Hi. Dumb question. Decided to make this but only cut up half a cauliflower since I’m the only one trying this. It was 3 cups cooked. Should I half the other ingredients? Hi Gina. I love your recipes. I’m not a fan of hard boiled eggs. Wonder if I don’t use this if something could be used. Or should I just try it without? Thanks for any ideas as this sounds good! Amazingly so good — amazingly because so hard to tell it’s cauliflower, thanks for all your great recipes. I did make this with Hellman’s, Olive Oil Mayo and it took it down to 3SP, at least the way I figured it. Please correct me if I miscalculated. Second time: used miracle whip instead of mayo and used dill pickle relish instead of chopping dill pickles. Ran it through ww recipe builder and now each serving is 2 points! Woohoo. Still tastes great. Delicious! Easy recipe to make. Just as good the next day – nothing gets mushy. Perfect summertime side dish. Yes, take it to the potluck. Your friends will marvel with delight when they realize it’s cauliflower. This tastes as good as potato salad. I am sure I will be making it many times over! This is amazing !! I’ve made it several times now . And yes it’s even better on the 2nd and 3rd day . Thank you so much for sharing this recipe Chris ?? Has anyone made it with frozen cauliflower? just made this salad and I am so loving it. 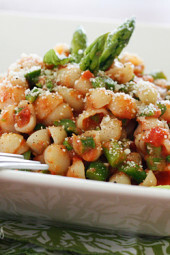 I added red peppers and a little bit of bacon and this salad is definitely one to keep! yum yum. Gina, you keep impressing me ! This was fantastic. I tried it on neighbors at a cookout and it was liked by all who like potato salad. One neighbor even said “This is really good. Is there cauliflower in this potato salad?” I wasn’t even going to try it because it seemed far-fetched to compare it to real potato salad. But a co-worker who is also on the keto diet said she made it and thought it was better than potato salad. Glad I tried it! This is a a terrific recipe. All the good taste of potato salad without the carbs. I made it with Trader Joe’s froze riced cauliflower, defrosted in the microwave. Cut down on prep time. Really delish. Everyone loved it at our July 4th barbecue. Absolutely delicious, even better the 2nd day! Gina thank you thank you thank you! Every recipe that I’ve made of yours has been fabulous! Always big on taste and nice to know a healthier choice. You’re the best for all your free recipes and they’re much appreciated! O.M.G. Was this delicious!!! Absolutely going to be making again soon. Thank you so much for all the great recipes. I just got my copy of your first book last week and can’t wait to make my way through it! Followed this recipe to the T and everyone loved it! They didn’t even miss the potatoes at all. Thank you so much as I was really needing to find something to bring to a BBQ last week and this was PERFECT with hot dogs and hamburgers! I entered this into the WW freestyle app. & it came up as 7 points. I decided to make my own version buy using a Green Giant 12 oz shredded cauliflower bag & just made smaller portions of the mayo pickles mustard. It turned out super yummy. Don’t change a thing! This was totally fantastic. Not a huge potato lover anyway. This was soooo good! Will be making this just as is all summer long. And for those who think they will miss the potatoes, not at all! Tastes like the real thing. This will definitely be a favorite recipe. Thank you. This is a great alternative to potato salad. It really gives you the same satisfaction and feel. My diabetic husband is on a low carb diet for his health, and he loves this salad. It’ll be a regular dish for me to take to the barbeques. Love it! This is a good recipe! I followed the recipe but added some vinegar with sweetener in it to the dressing. Made it perfect for our individual taste preference. This was super! Thanks to Gina for yet another fantastic recipe! I made this today! It was fantastic! Another great recipe from Skinny Taste. Thanks for sharing this recipe. I am planning on making this and was wondering how far ahead it can be made? I have made once and we enjoyed. I’m adding a little more pickle juice and additional pickle for holiday version. Personal preference. Great recipe! Seriously??? This wonderful lady is taking the time to make these recipes and share them was us for free and not only that they’re delicious and you have the nerve to try to call her on little petty stuff like this please get real!! Good taste. Pretty close to potato salad. I made it with low fat Hellmans mayo instead of full day mayo. So it got a bit weepy the day after I made it. I think potatoes would have absorbed the extra moisture. But hey. Good nonetheless. WOW – I really enjoyed this recipe!! I made my husband try it with full disclosure that it was potato salad without potatoes. We had some heated discussion about what to call it but honestly once you try it you will agree it felt like you were eating potato salad. (my opinion of course) I have also shad with my WW and Low Carb friends! Very very good..I used frozen cauliflower florets steamable pouch..1 pkg enough for 2-3 people..only thing different I always add a splash of vinegar into my potato salad instead of pickle juice..husband loved it..no carbs.. This. Is. So. Good!!! My husband actually requested I make it twice last week! Thank you for a healthier option for summer time potato salad! This was fantastic! Agreed hubby wasn’t as much a fan as I was but he still ate an entire bowl. I did add some fresh herbs since we have our garden going (cilantro, basil, and chives) and I was so full on just a half cup it was crazy. Made this fabulous ‘faux’tato salad for the church cookout last weekend and even though there were at least 4 more actual potato salads there, my fauxtato salad disappeared first. No one knew it was NOT really potato salad! LOL! I did use my usual potato salad fixin’s including some sweet pickle relish, minced garlic and Jamaican curry powder. But the frozen cauliflower rice and the fresh chopped cauliflower left no need for potatoes, which, by the way I had originally purchased for the event. So glad this recipe shows up and enticed me to abandon the potatoes. Only drawback was I left too little at home to eat later. Even my sister, a vegetarian who hates cauliflower asked for more! Excellent recipe, loved it! Just made it and was a bit skeptical but it truly tastes close to the original potato recipe. Thank you! Spot on. Husband said was as good as any potato salad he ever had. I made this last week and it is spectacular! Love the celery and onion for the added crunch! The flavor is amazing and it has all that extra protein from the eggs to fill me up. At first I thought i cooked the cauliflour too long Bc seemed mushy in the strainer. But after cooling and adding everything together it was perfect! Will definitely make it again (and I used the pre-cut bagged fresh cauliflower). Made this last night, and it was a big hit! This is the first “faux” potato salad recipe I’ve made that tastes really close to regular potato salad and the first one that’s totally a “keeper”! I think it would be good with sweet pickle instead of dill,; you could sub ground mustard for yellow; and the addition of bacon would be amazing as well. Lots of great options here, but it’s amazing as-is, too. It’s even better the next day which is the hallmark of a good potato salad, in my book (well, if you have leftovers, that is)! Thanks, Gina – another big winner! Thanks Kris! Glad you enjoyed it! Just made this for a Father’s Day barbecue,this is an outstanding recipe,didn’t miss the potatoes at all,will be making this a lot this summer,thank you!!! Thanks for another incredible recipe! I followed the recipe aside from less eggs and adding some bread and butter pickles, as I do when I make regular potato salad. Everyone loved it! 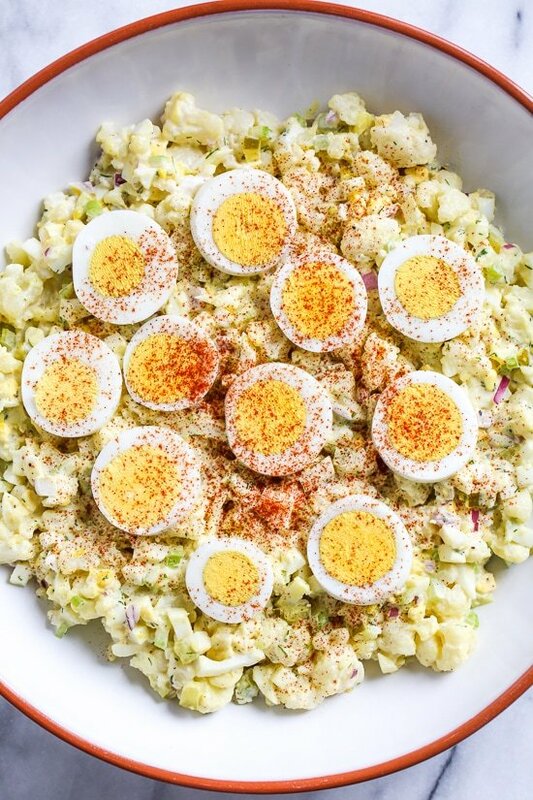 I couldn’t decide if it reminded me of potato salad or macaroni salad more….regardless, it’s a solid summer salad without the guilt. So happy you all loved it!! OMG…… This is an awesome recipe. It taste so good, honestly I don’t think most people would know the difference. A couple of my coworkers tried it and immediately asked for the recipe. Thanks for sharing. Will definitely be trying this. I’ve been avoiding potatoes for the last two years, and the hardest to give up was potato salad. Looks like I might enjoy 4th of July BBQ after all :-)! Thanks!! I’m planning on bringing this to a July 4th party, Sounds really good and a little different. Best of all, I already have everything I need in the house. I’m just wondering whether I can use a little diced up, crisply cooked bacon sprinkled on top for some extra flavor. Bacon makes everything better. I just made your mock potato salad. I don’t miss the potatoes at all, it is really good! I made mine with frozen cauliflower “rice” so it was super easy! OMG I’ve been saved from my potatoe salad craving!!!! so good and really easy. Let it sit overnight and its even better the next day.. You would never guess this is cauliflower. WOW!!! This is terrific! I’m not a huge cauliflower fan, but I loved this and would definitely make it again. It really satisfies a potato salad craving. I don’t think I’ve ever made a bad recipe from your site – my husband loves when I use your recipes. Great food with realistic portion sizes! Can you include a link to the mayo you used. On their site, I only see avocado oil mayo, and the classic and organic both use sunflower oil. Thanks! Delicious! I was getting tired of all the cauliflower dishes because in the end they all taste like cauliflower. Don’t get me wrong…I like cauliflower but I also like variety. I love potato salad and have been craving it. 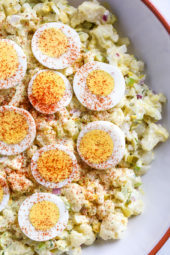 This recipe is almost identical to my potato salad recipe. Making it ahead, letting it cool in the fridge….every time I opened the fridge door, it smelled just like my potato salad. And even though the consistency is a little different, it tastes like potato salad!!! My family loves it and I will be making this for all of our cookouts! Okay, I was skeptical about this recipe, truly skeptical. However, my husband is following a low-carb diet and I am doing Weight Watchers, so recipes that we can both have a rare. Since we haven’t had anything bad from this site I went ahead and made this yesterday and it was AMAZING! The only thing I did differently was I cut the cook time on the cauliflower down to 3 minutes and added some additional dill. Seriously, this was so stinking good and we really did not miss the potatoes! This will be in our regular rotation for sure! Great recipe. Like with potato salad, I include a little vinegar with the pickle juice, spices, mustard, celery and onion, and let them stew in the bowl for a 10-30 minutes before adding any other ingredients. It pickles the onions making them more mellow and releases the flavor of the spices. Saw this recipe and passed. Then I came back to it. Just made it for dinner tonight and it is so good. If you dont look closely I do not think it would occur to you that it isnt potatoes. Great summer dish. . Love it. Now to see how the hubby likes it. Thanks! I made this as a side for dinner tonight and it was hard to not eat a dinner-sized portion standing at the counter. So delicious, thanks for the great idea! This s a wonderful recipe! Made it with a BBQ with friends and they loved it! As well, shared the recipe and link with my Weight Watchers group! Thanks Gina-love your recipes! Had this for dinner tonight and it was fabulous! 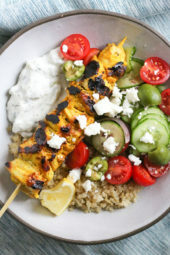 Used 50% light mayo + 50% fat free yogurt to keep the calories down and it still tasted great – definitely a regular for us!! Low carb here ? ?‍♀️ Think I’ll try the cauli rice from Costco in it. Wonder if the consistency will change ? did you try the rice in it, yet? I was thinking about doing that too! Wondering how it will turn out! This was so good, and it absolutely satisfied my potato salad cravings! To cut back on calories, I substituted half of the mayonnaise with nonfat Greek yogurt (I used Chobani)–it was still creamy and delicious. I just ate two servings for a 320 calorie lunch. i love this! What a fab low carb sub — I’m always looking to do some low carb where I can to balance out the other things that can’t be low carb (looking at you, s’mores). Can’t wait to try! I make this with cauliflower, sometimes add sliced radishes as I use to in reg. potato salad. The recipe I have calls for 3 T. relish instead of the dill. I love dill and will use it next time. I have found a fat free miracle whip. I like it but it is slightly sweet. Gina wondering if u have seen that type of mayo and used it = if so what is your take on it?. This was delicious – thank you! I made it simply because I love cauliflower. I was going to make cauliflower mashed “potatoes” but then saw this and had to try it. I don’t keep pickles on hand so I used a bit of capers and brine instead but followed everything else in the recipe. Excellent! Hard to stop at one serving. Gina, I’ve been daydreaming about this ever since I opened your recipe email this morning!! I printed it out and got to cooking as soon as I got home. Made the eggs in the instant pot (3 mins high pressure, 5 mins NR, then cold water bath and they were PERFECT) while the cauliflower cooked. Everything came together quickly and I had every on hand, minus fresh dill. It was still great with dried dill weed! I have to use shallots in place of red onions, as they make my stomach upset but the flavor was still wonderful. I subbed in a lower calorie whipped salad dressing (Aldi’s Burman’s brand) and found I liked the subtle sweetness. I ate it immediately after stirring it up and can’t wait until it sits a bit in the fridge for the flavors to meld even more. Thank you so much for a fantastic summer side dish!! I was skeptical with no potatoes… but this is delicious! I wanted to eat all of it. It hit the spot!! This sounds perfect! I can not wait to try this!!! This would be a great bbq side or great for a camping trip. If you use reduced fat will it change the weight watcher points? If so, how many point would it be? If you use Hellman’s light mayo, it is 2 freestyle points per serving. I will excited to try this but agree with the above comment. I will add about 1/2 a cooked potato to the mix. I do that sometimes with cauliflower rice – I add in about 1/8 cup – 1/4 cup cooked rice (for one serving). I picked this tip up from one of Oprah’s blogs. When the email came in, I was wondering how Gina made potatoes lower carb. Shouldn’t this really be called low carb CAULIFLOWER salad? or low carb potato salad style cauliflower? Cauliflower is not a potato! this just feels like click bait. 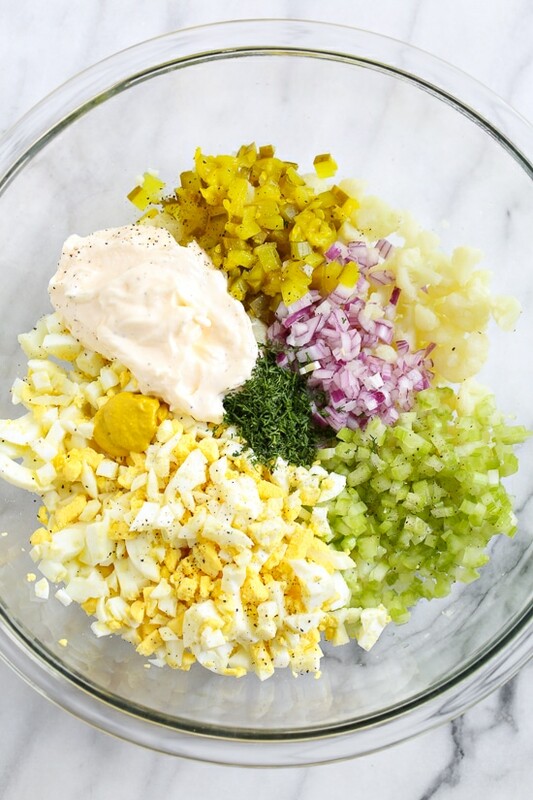 Clearly in the first line without having to open the email it says A low-carb faux “potato” salad made with cauliflower instead of potatoes, perfect for Keto or if you’re just looking to eat less carbs. No bait, I think by now people know my recipes. I don’t think it was intentional click bait. It didn’t come through on my email as not being made of potatoes until I went to the recipe. So maybe that was a source of confusion for some. In the email it said “Low Carb Potato Salad.” Wasn’t till you got to the recipe that it said it was cauliflower. But I don’t think “reader” was a troll, either. Just someone irritated that the real ingredient wasn’t in the recipe. I will be trying this in advance of a picnic we’re going to in July. Really “reader” all the work Gina does and shares her recipes for free, you have the nerve to call her emails “chickbait”. Grow up and try thanking her instead of complaining! Click bait? …It says low carb! What did you expect? Don’t be ignorant. If it wasn’t what you were looking for just look for something else instead of being negative! This is a great recipe! I used to follow the directions when I first started this low carb diet but I absolutely hated the smell of the cauliflower cooking in my kitchen Plus The time-consuming Chopping it up. So one day I decided to try Frozen cauliflower and guess what it works just as good and it tastes just as good with one third of the work. 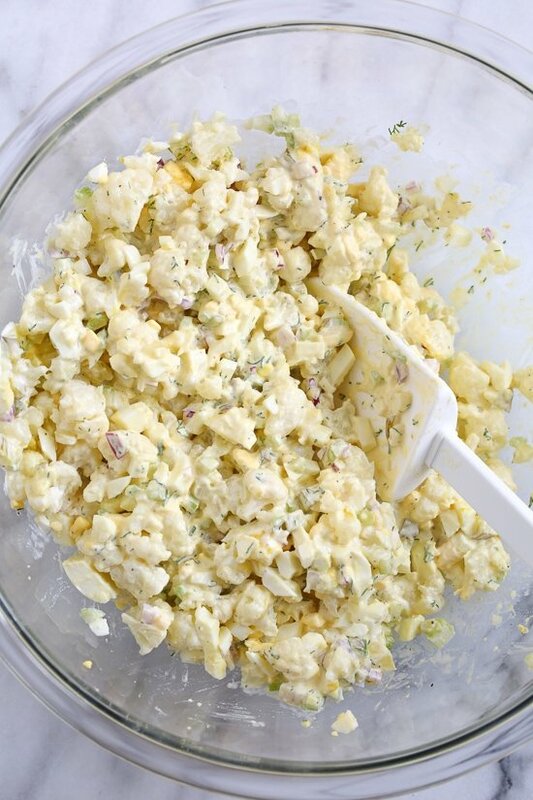 This is my go-to when I want potato salad I have cauliflower salads and I love it! don’t u still have to cook it? This is exactly my problem w/cauliflower- we hate the smell of it cooking. Love this idea, but not clear to me regarding does it need to be cooked still? If you use frozen, you don’t need to cook it. It’ll be soft when thawed. Been making a version of this for years. Long b4 KETO and the low carb craze, Dr. Atkins introduced all of this stuff ?. Super delish! I like it better than potatoes! My side note, be sure to use fresh not frozen. I’m going to try this over the weekend. I love potato salad but I’ve been trying to stay away from carbohydrate dense foods like potatoes and rice. This recipe looks PERFECT! Thanks, Gina, for your creativity. I wonder if it’d be good with half potatoes and half cauliflower to give it a bit of that “real” potato salad taste? Nonetheless, looks tasty as always. I have and you won’t need any potato in it. You won’t even miss potatoes. Definitely WON’T miss the potatoes…it’s excellent! Try it! Sounds great! I bet it would totally work.